A Destroyit high capacity shredder is the most secure and economical way of disposing sensitive documents for organizations with a need for high volume shredding, or who have an in-house destruction program. Using a shredding service adds needless legal risk exposure and expense. With one of these large shredder models, you can destroy documents, and other printed matter with-out having to worry about the risks. When you turn over documents to an outside company for disposal, you are effectively relinquishing control of your document security program. The more hands your documents pass through, the greater the chance they will be viewed by others. Depending on model, three-ring binders, VHS tapes, CD’s and even entire wastebasket contents can be fed into these powerful volume shredders in large quantities. Available Destroyit - Ideal-MBM High Capacity Shredder Models are: 4107 and the 4605 - Available in Cross cut or Strip cut model. 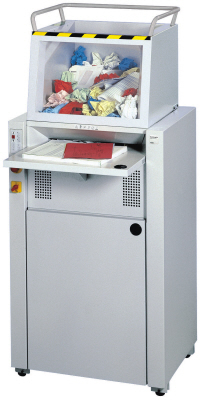 The Destroyit 4107sc's High Capacity Volume Strip Cut Shredders are multimedia capable, heavy-duty, high-volume machines specifically designed to shred large volumes of material daily. This model comes in 3 shred size formats. 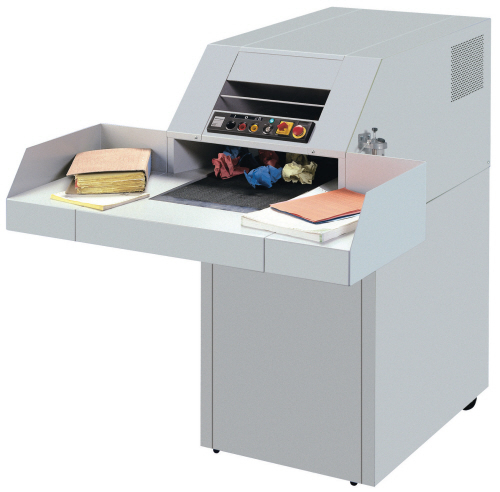 The bulk shred format of these Destroyit models allows you to shred high volumes of multi and mixed media, including: Paper, staples, paper clips, smart cards, credit / debit cards, CD's / DVD's, Non-uniform / crumpled, matter, hard bound documents, *VHS tapes / Magnetic media.